Residence Life strongly supports sustainability. 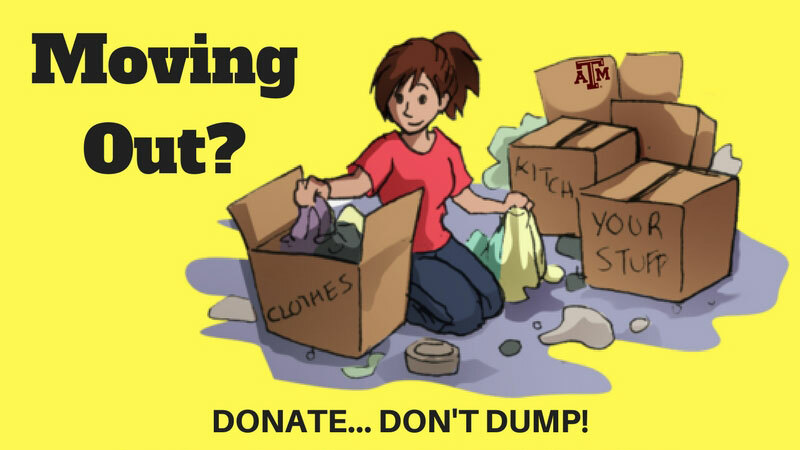 Therefore, as you are preparing to move out at the end of the Spring semester, we are asking that you Donate… Don’t Dump! Do you have non-perishable food items, clothing, and other household items that you don’t want to pack up and take with you? Don’t throw them in the trash! We have a sustainable solution!! Residence Life has partnered with Goodwill Industries and The 12th Can, a student-run food pantry, who are providing trailers, trucks, and bins in convenient on-campus drop-off locations Friday, May 4 through Thursday, May 10 (except on Sunday) so you can donate these unwanted items rather than adding them to the landfill. Goodwill Industries will have trailers, trucks and bins available for donations of clothing, small appliances, and household items. These locations will be staffed 8:30am to 4:30pm. Give items a second life and help provide jobs. The 12th Can is a student-run food pantry for use by faculty, staff and students will have collection bins for non-perishable food. 24/7 Service Desk at Southside Commons. The in-hall recycling containers will also be available. Please take care with what is placed in waste containers vs recycling containers. As waste containers fill up, please be mindful NOT to put waste in the recycling containers. The big ‘green worms’ for recycling will remain in place. Students are welcome to transport their own recycling to those containers. The campus takes aluminum and plastics in one stream and paper and light cardboard in another stream. Heavier cardboard can be handled/dropped off at some of the sites. NOTE: The Gardens Apartments and West Campus sites have room to drive-up close to unload.